The foundation of all SMGA programs are in the adaptive golf clinics we offer. SMGA golf clinics are designed for wounded and injured servicemen and women who are in the midst of their recovery and transition from hospital to home-life or back to active duty. 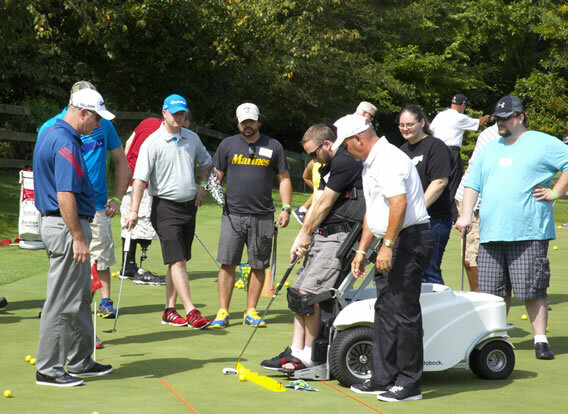 Our adaptive golf program that brings the game of golf to even the most severely injured. SMGA’s golf clinics form a true community, with each chapter or affiliate expressing their own unique personality and feel. SMGA clinics promote camaraderie among warriors and encourage family centered activities. On occasion, clinics extend beyond the mechanics of the golf swing to include related topics such as golf-specific exercise training, nutrition, and community service. The SMGA clinic program is structured to challenge any golfer, whether beginner or single-digit handicap. The social interaction and networking opportunities that exist through the game of golf are unmatched in any other sport, and provide a vehicle for integration back into the civilian community. The American Golfer Program (AGP) affords participation in SMGA to wounded warriors who are not located within close proximity to one of our clinic locations. This program matches post-9/11 wounded warriors with PGA of America professionals familiar with teaching adaptive golf. Through the program, SMGA offers a series of private golf lessons covering all aspects of the game of golf. SMGA provides a custom-fitted set of clubs to any warrior completing the program. Please check out our Event Calendar for even more SMGA events and activities. If you have any additional questions, please Contact Us. Every June, the SMGA holds its Annual Charity Golf Classic. This tournament remains a primary fundraising event for the SMGA. We are very thankful and proud to recognize an amazing group of sponsors who continue to support us year after year. If you are interested in learning more about participating, or becoming a sponsor please click below. Each year, the SMGA and Booz Allen Hamilton partner to hold a nationwide series of golf fundraising tournaments to benefit our programs. With tournaments held across the entire country, you can support the SMGA no matter where you are, and have fun doing so! For more information about this year’s locations and how to sign up, click below.